The line between sport and safety is wearing thin, writes Eamonn Grennan. If you have symptoms of a suspected concussion you must STOP playing and INFORM medical and/or coaching staff immediately. Be honest with yourself and those looking after you. From A Guide to Concussion in Rugby, IRFU. Hypothetical sports fantasies are something many devoted punters have dreamed up when their team reaches heady highs, but there might be one that poses more concern for coaching staff and the player themselves. Imagine, say, the Seattle Seahawks are contesting the Superbowl, and at the interval of the 2nd and 3rd quarters, Richard Sherman, one of the most acclaimed cornerbacks in NFL history, is suspected to have sustained a concussion. If the game hangs in the balance, will coaches be so eager to remove such a key, match-winning player from the game completely? What would have happened decades ago, before such care was taken with traumatic brain injuries in the top echelons of sport? Sherman’s position is the one most reported to sustain concussions in play, with 22 official concussions among cornerbacks for the 2013-14 season alone. American football, a sport centred around short, sharp and brutal punctuations of violence, has an unavoidable past with regards the controversial aspects of player welfare. Akin to rugby, MMA and boxing, an increasing emphasis on size and power allies to a demand for increasing physical prowess to win. So many athletes are encouraged to dedicate their training and diet towards outmuscling their opposition in these contact sports. Does this paradigm shift in sporting culture signal the beginning of waves of retiring players developing life-shortening diseases? George Visser’s life is one of those that was seemingly measured in viewership and saving face for the NFL. A SuperBowl winner in 1981, the retired player developed hydrocephalus and frontal lobe dementia after a mere two-year career in the sport, and fought numerous court cases to subsequently receive compensation for his medical bills, years before the NFL’s acknowledgement of any correlation. Losing his family, his home and any hope of career advancement as a biologist, he succeeded in 2013 as one of thousands of former players to receive a cumulative $765 million in total paid out by the organisation. Visser’s settlement was reduced from $2 million to $240,000 after reductions due to prior surgery and his age after the case – 56. He lived with brain damage for the bulk of 30 years. Multiple suicidal thoughts shook him alongside advancing psychosis. Ultimately, his story ends with him living alone and divorced from his wife, upstairs from an oxygen therapy clinic where he receives treatment. His case is one of those where the public resolution is indeed highly different to that behind closed doors. If Visser and his fellow retirees are suffering as early as their late 20s from traumatic injury, how will current or future stars be affected as physicality and high impact remain king? As players increase in size and collisions intensify, all for the sake of shutting down defences and increasing trophy chances, the measurement of players in terms of neurological statistics isn’t feasible. Closer to home, the effects of World Rugby’s harsher sanctions for higher and more dangerous tackles has shown as much reduction in actual dangerous tackles as well as an increased amount of citations and cardings. Here lies the change in the landscape of the game that for many has impacted the entertainment value for many viewers. Will referees consistently and efficiently make the correct call on controversial game-changing decisions that could result in flack from millions of supporters? When the safety of the player is concerned and paramount, the answer should be an effusive yes. The death of Antrim schoolboy Benjamin Robinson in 2011 from second impact syndrome on his teams rugby pitch contributed to numerous of changes for safety in the amateur and professional arenas. Further progress by Saracens RFC on concussion monitoring in several top flight matches sought to measure the approximate force of impacts on players from tackling and being tackled, as well as advanced software, myplayXplay, to directly allow analysis of real time footage by medical staff – 50% of total concussions during the 2015 World Cup were identified in this immediate way, without the need for off-field head injury assessment (HIA). Perhaps allied to the relative narrow audience for rugby, largely confined to Europe, Oceania and the Americas, World Rugby has had a smoother and less high-stakes transition into player welfare compared to American football. Maybe it’s typical of a nation prone to mammy reactions that Ireland has taken contact sport injuries with high interest towards ensuring player welfare, but these changes in rugby should be consistent on all levels of contact sports prone to injuries. 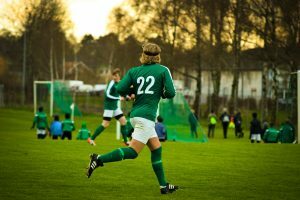 Gaelic and soccer are growing more attractive for many parents fearing for the lasting damage of their still developing children, as well as a perception that there is more natural skill involved. The stigma of head injury won’t evaporate, but it can be carefully monitored and treated on all levels, with an aim for educating wider audiences. How contact sport develops as the money invested and the audiences increase will be telling in the coming decades. If more cases like George Visser develop after seemingly innocuous careers free of repeated traumatic head injuries, it could mark a sea change in regulations for sports that are not just traditional entertainment, but also livelihoods for thousands of professionals. The choice between a trophy and a healthy brain should be fairly straightforward. Dr. Bennet Omalu and his travails exposing the lasting impacts of chronic traumatic encephalopathy (CTE) in the NFL included a protracted 7-year span between the NFL’s acknowledgement of the links of football and long-term neurological effects (2009) and the actual testimony of the NFL vice president for health and safety, confirming correlation between the two, in front of US Congress. Clearly, millions of impressionable parents of potential football stars are better off not worrying about their child as a future neurological patient, according to the NFL. Now, as recently as November 2017, Omalu has helped confirm the diagnosis of CTE in a living person for the first time – former linebacker Fred McNeill. These ever-developing studies have contradicted much of what the NFL has said in the past about the dangers of brain injury in players; when a sport has a centerpiece final of 111 million American viewers and a price tag of $5million per 30 seconds of advertisement, its understandable that investors want to maintain the cash flow. However, does trading years or even decades off lives for entertainment and business capital sound ethical?